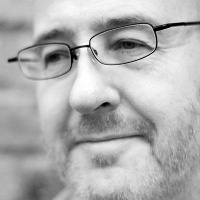 Yes, chaps and chapettes, my guest today is none other than that quintessential Englishperson, Ian Hutson, who is so very, very, veddy, veddy British, he makes P. G. Wodehouse sound like Ernest Hemingway. The future Sir Ian runs (and sometimes hides in the shadows) the blog of all blogs, The Diesel-Electric Elephant Company. 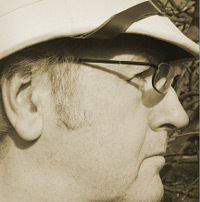 He has agreed to join us today for a live radio interview on the subject of his new short story collection. But, since I’m too cheap to buy a microphone, and neither of us wanted to get up in the other one’s morning, the live radio interview will be a pre-posted text non-live non-radio interview. MA: Future Sir Ian, are you there, sir? Tell us something about your background. How did you come to be who you are, sir? The Future Sir Ian: My father was a deep-sea fisherman turned Cold War spy, an electronic-warfare expert turned naval historian. My mother was a factory-worker, home-maker, socialite and lady. When I was born we immediately moved to Hong Kong for the tail-end of the colonial era and the worst cholera epidemic, drought and typhoon of the century. As a rug-rat and child I spoke only Cantonese and a very little pidgin English. I finally learned to read and write at age nine, on the Isle of Lewis in the Outer Hebrides, Scotland in the era when the tawse (a leather strap) was still used for the encouragement of schoolchildren. There we lived on a croft that had only one room with the mains electrickery, my father fetched water with him in carriers from work (jamming and monitoring Soviet signals), my sister and I kept two pet sheep and we all cut peat to burn in winter. When I was aged ten we lived in a friend’s public zoo in Norfolk (and I skipped school for the year). We had a shack between the bear pit and the monkey house, I used to go to sleep at night to the sound of the howler monkeys and gibbons hooting. Aged fourteen and back in Lincolnshire I enjoyed the part-time job of driving my Aunt around to lay off her semi-pro bets at bookmakers. She just assumed that I could drive, gave me the keys to her shiny new Audi and sat in the back seat. Later, I studied a BA in Operation Research Systems Analysis and a Masters in Industrial Relations (left-wing insurrection by any other name). My first job was in the Civil Service and then for corporations such as EDS, ITSA and AVIVA. I got shot at only once, and that while off-duty and when my car was stopped at traffic signals, but they missed me and I have to say that those few seconds of tyre squeal, smoke and acceleration were the only interesting ones of my entire three decades of the corporate career ladder. I took the hint and left to run my own businesses, slowly went quite literally bankrupt when the world folded and the banks went belly-up, and lost my home, car and household valuables to the Official Receivers. I’m now a peacenik vegan hippie living in a hedgerow in Lincolnshire, England, and my hobbies are starving, patching my underwear and being happy. My motto is “Remember you’re a Womble” and, if all else fails, try to have a hot curry and a cold G&T. MA: Excellent, sir. Very good. Now, what’s this we hear about a new short story collection? 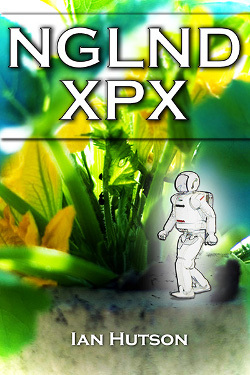 TFSI: Nglnd Xpx is ten stories of robots carrying teddy bears, dirty great steam trains, polite English zombies, old-age pensioner wars, rogue comets and Queen Elizabeth doing dishes. It is one hundred thousand words where half of that would really have done and from quite serious beginnings to blathering nonsense, no caricature is forgotten and the science in the fiction is quite splendidly silly. MA: Not to put too fine a point on it, what the frack is Nglnd Xpx supposed to mean? TFSI: Not too terribly bright, is one? Oh, I’m so sorry, did I say that out loud? Nglnd Xpx is text-speak for England Expects. MA: Of course it is. Of course it is. I was only fooling. I knew it all the time. And where can this masterpiece be found, other than on my electronic reading device, since I snapped it up like an alligator at a synchronized swimming convention? TFSI: It can be found at Smashwords and Amazon, old thing. TFSI: Y is one of my favourite letters of the human alphabet, although if pressed I will also confess to a certain fondness for the C, coming as I do from a fishing family. Bs upset me rather if they buzz, but my favourite letter for calming myself down is undoubtedly the T. T is a curious letter, since it is a drink with jam and bread. One of my pet hates is having to Q for a P, thus proving that L is indeed what other people R. Perhaps one of the greatest mysteries of life is the Y Knot, which is often tied around mountains just because they are there, and around books just because the author can. This is a serendipitous coincidence since in the matter of why I write, I do because I can, regardless of whether I should or even ought. I think we all should, where possible, don’t you? We all apparently have a book within us and, while removing it can make a dreadful mess of the library rugs and of one’s status as a free man, the extra space does come in very handy for pudding. TFSI: Who eh? There’s the what of it indeed. Tom Sharpe, Robert Heinlein, Enid Blyton, W E Johns, Pournelle and Niven, Aldiss, Huxley et al – the what in those particular cases of whom being “everything” and “anything”. An unholy mix of Biggles, the Famous Five, Pierson’s Puppeteers and Constable Els roam around in my head, quite unfettered, and my life is all the better for it. TFSI: More accustomed as I am to Hello, I’ll see your How and raise you a G’day. An alternative how may be “as often as possible and by torchlight if necessary” (in re the reading of the aforementioned who and what, for reasons mentioned in the why). 4) DID the chicken cross the road? TFSI: I prefer to think that the road moved under the chicken. The hen is a simple creature and as such highly unlikely to engage in complicated spontaneous manoeuvres with motor traffic. That which is not the chicken, being of such demonstrably larger size and being more inclined to reasoned thinking, almost certainly just shifted to the left or the right by the width of a carriageway. This is why chickens at the side of the road often look surprised, for a moment hitherto they were elsewhere, minding their own business. As a sentient part of the universe we humans really ought to stop playing these tricks on hens. MA: I thank you, sir, and, if I may say so, God bless Nglnd. A WRITING PROMPT FOR YOU: Where was that motor vehicle going when it passed the hen? This entry was posted in Guest Posters. Tagged guest writer. The Future Sir Ian is almost as clever and charming as you, Ms. Allen. Oh, dear! Damning the poor chap, are you? Tut tut. Ma’am, Her Majesty the Queen Person of England, Lizzie, has asked me to indicate to you her satisfaction with your kind interview, although Her Maj did add that you have been too kind in regards to Mr Hutson’s “boat race”, in that he has not been regarded as anything other than distressingly undecorative since being lifted one last time from his pram in the autumn of nineteen seventy-six. Honey, just between you and me and the lamp post, Lizzie ain’t the only dame who’s been known to give a guy her garter, and you can tell her I said so. Marian, I passed your message on to Her Majesty and her official reply was ‘This much is true.’ Her Maj challenges you to a duel – garters at dawn, on The Mall. Thank you again for his most splendid write-up m’dear, I have dunked a teabag in your name by way of thanks! Tell Her Maj to enjoy the dawn. I’ll be there at high noon. What fun this was and so welcome on a day that I needed a good chuckle. There was so much to enjoy in the interview it is hard to pick out one thing that was the best, but I did love the play with letters. I have never been fond of the letter x. I think because it was used to cross out too many mistakes when I was merely typing manuscripts on my old royal manual typewriter and ran out of correction fluid. It is if it is on a map, right Marian? I don’t know about that, Maryann. I’ve drawn X’s on every map I can, and I’ve never found a treasure yet!